Many Unix and Linux distributions use init scripts to start daemons in the same way that Unix System V did. This chapter will explain in detail how that works. Init starts daemons by using scripts, where each script starts one daemon, and where each script waits for the previous script to finish. This serial process of starting daemons is slow, and although slow booting is not a problem on servers where uptime is measured in years, the recent uptake of Linux on the desktop results in user complaints. To improve Linux startup speed, Canonical has developed upstart, which was first used in Ubuntu. Solaris also used init up to Solaris 9, for Solaris 10 Sun developed Service Management Facility. Both systems start daemons in parallel and can replace the SysV init scripts. There is also an ongoing effort to create initng (init next generation). In 2014 the systemd initiative has taken a lead when after Fedora, RHEL7 and CentOS7 also Debian has chosen this to be the prefered replacement for init. The end of this module contains an introduction to systemd. The kernel receives system control from the bootloader. After a while the kernel starts the init daemon. The init daemon (/sbin/init) is the first daemon that is started and receives process id 1 (PID 1). Init never dies. When /sbin/init is started, it will first read its configuration file /etc/inittab. In that file, it will look for the value of initdefault (3 in the screenshot below). The value found in initdefault indicates the default runlevel. Some Linux distributions have a brief description of runlevels in /etc/inittab, like here on Red Hat Enterprise Linux 4. Runlevel 0 means the system is shutting down. Runlevel 1 is used for troubleshooting, only the root user can log on, and only at the console. Runlevel 3 is typical for servers, whereas runlevel 5 is typical for desktops (graphical logon). Besides runlevels 0, 1 and 6, the use may vary depending on the distribution. Debian and derived Linux systems have full network and GUI logon on runlevels 2 to 5. So always verify the proper meaning of runlevels on your system. The next line in /etc/inittab in Red Hat and derivatives is the following. This means that independent of the selected runlevel, init will run the /etc/rc.d/rc.sysinit script. This script initializes hardware, sets some basic environment, populates /etc/mtab while mounting file systems, starts swap and more. # Start the graphical boot, if necessary and not done yet. # Initialize the serial ports. Debian has the following line after initdefault. The /etc/init.d/rcS script will always run on Debian (independent of the selected runlevel). The script is actually running all scripts in the /etc/rcS.d/ directory in alphabetical order. Init will continue to read /etc/inittab and meets this section on Debian Linux. On Red Hat Enterprise Linux it is identical except init.d is rc.d. In both cases, this means that init will start the rc script with the runlevel as the only parameter. Actually /etc/inittab has fields separated by colons. The second field determines the runlevel in which this line should be executed. So in both cases, only one line of the seven will be executed, depending on the runlevel set by initdefault. When you take a look any of the /etc/rcX.d/ directories, then you will see a lot of (links to) scripts who's name start with either uppercase K or uppercase S.
The /etc/rcX.d/ directories only contain links to scripts in /etc/init.d/. Links allow for the script to have a different name. When entering a runlevel, all scripts that start with uppercase K or uppercase S will be started in alphabetical order. Those that start with K will be started first, with stop as the only parameter. The remaining scripts with S will be started with start as the only parameter. All this is done by the /etc/rc.d/rc script on Red Hat and by the /etc/init.d/rc script on Debian. Almost at the end of /etc/inittab there is a section to start and respawn several mingetty daemons. This /sbin/mingetty will display a message on a virtual console and allow you to type a userid. Then it executes the /bin/login command with that userid. The /bin/login program will verify whether that user exists in /etc/passwd and prompt for (and verify) a password. If the password is correct, /bin/login passes control to the shell listed in /etc/passwd. The mingetty daemons are started by init and watched until they die (user exits the shell and is logged out). When this happens, the init daemon will respawn a new mingetty. So even if you kill a mingetty daemon, it will be restarted automatically. This example shows that init respawns mingetty daemons. Look at the PID's of the last two mingetty processes. When we kill the last two mingettys, then init will notice this and start them again (with a different PID). You can disable a mingetty for a certain tty by removing the runlevel from the second field in its line in /etc/inittab. Don't forget to tell init about the change of its configuration file with kill -1 1. The example below shows how to disable mingetty on tty3 to tty6 in runlevels 4 and 5. A daemon is a process that runs in background, without a link to a GUI or terminal. Daemons are usually started at system boot, and stay alive until the system shuts down. In more recent technical writings, daemons are often refered to as services. The K and S scripts are links to the real scripts in /etc/init.d/. These can also be used when the system is running to start and stop daemons (or services). Most of them accept the following parameters: start, stop, restart, status. For example in this screenshot we restart the samba daemon. You can achieve the same result on RHEL/Fedora with the service command. You might also want to take a look at chkconfig, update-rc.d. The purpose of chkconfig is to relieve system administrators of manually managing all the links and scripts in /etc/init.d and /etc/rcX.d/. Here we use chkconfig to list the status of a service in the different runlevels. You can see that the crond daemon (or service) is only activated in runlevels 2 to 5. When you compare the screenshot above with the one below, you can see that off equals to a K link to the script, whereas on equals to an S link. Here you see how to use chkconfig to disable (or enable) a service in a certain runlevel. This screenshot shows how to disable crond in runlevel 3. This screenshot shows how to enable crond in runlevels 3 and 4. Every script in /etc/init.d/ can have (comment) lines to tell chkconfig what to do with the service. The line with # chkconfig: contains the runlevels in which the service should be started (2345), followed by the priority for start (90) and stop (60). #              security and more powerful configuration options. Services can be enabled or disabled in all runlevels with one command. Runlevels 0, 1 and 6 are always stopping services (or calling the scripts with stop) even when their name starts with uppercase S.
The Debian equivalent of chkconfig is called update-rc.d. This tool is designed for use in scripts, if you prefer a graphical tool then look at bum. When there are existing links in /etc/rcX.d/ then update-rc.d does not do anything. This is to avoid that post installation scripts using update-rc.d are overwriting changes made by a system administrator. As you can see in the next screenshot, nothing changed for the cron daemon. Here we remove cron from all runlevels. Remember that the proper way to disable a service is to put K scripts oin all runlevels! 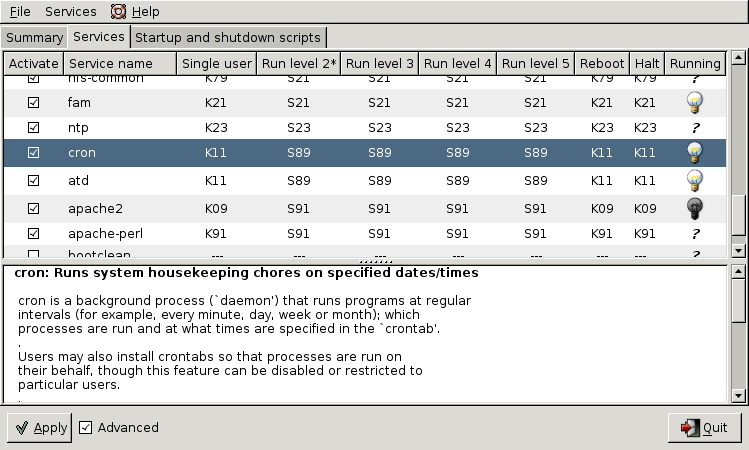 This screenshot shows how to use update-rc.d to enable a service in runlevels 2, 3, 4 and 5 and disable the service in runlevels 0, 1 and 6. And here is an example on how to set your custom configuration for the cron daemon. root@barry:~# update-rc.d -n cron start 11 2 3 4 5 . stop 89 0 1 6 . This screenshot shows bum in advanced mode. You can see your current runlevel with the runlevel or who -r commands. The runlevel command is typical Linux and will output the previous and the current runlevel. If there was no previous runlevel, then it will mark it with the letter N.
The history of who -r dates back to Seventies Unix, it still works on Linux. You can switch to another runlevel with the telinit command. On Linux /sbin/telinit is usually a (hard) link to /sbin/init. This screenshot shows how to switch from runlevel 2 to runlevel 3 without reboot. The shutdown command is used to properly shut down a system. Common switches used with shutdown are -a, -t, -h and -r.
The -a switch forces /sbin/shutdown to use /etc/shutdown.allow. The -t switch is used to define the number of seconds between the sending of the TERM signal and the KILL signal. The -h switch halts the system instead of changing to runlevel 1. The -r switch tells /sbin/shutdown to reboot after shutting down. This screenshot shows how to use shutdown with five seconds between TERM and KILL signals. The now is the time argument. This can be +m for the number of minutes to wait before shutting down (with now as an alias for +0. The command will also accept hh:mm instead of +m. The binary /sbin/reboot is the same as /sbin/halt and /sbin/poweroff. Depending on the name we use to call the command, it can behave differently. When in runlevel 0 or 6 halt, reboot and poweroff will tell the kernel to halt, reboot or poweroff the system. When not in runlevel 0 or 6, typing reboot as root actually calls the shutdown command with the -r switch and typing poweroff will switch off the power when halting the system. halt, reboot and poweroff all write to /var/log/wtmp. To look at /var/log/wtmp, we need to use th last. When rc is finished starting all those scripts, init will continue to read /etc/inittab. The next line is about what to do when the user hits Ctrl-Alt-Delete on the keyboard. Here is what Debian 4.0 does. Which is very similar to the default Red Hat Enterprise Linux 5.2 action. One noticable difference is that Debian forces shutdown to use /etc/shutdown.allow, where Red Hat allows everyone to invoke shutdown pressing Ctrl-Alt-Delete. It will read commands on what to execute in case of powerfailure, powerok and Ctrl-Alt-Delete. The init process never stops keeping an eye on power failures and that triple key combo. It is likely that systemd will replace all the standard init/runlevel/rc functionality. Both Red Hat and Debian have decided in 2014 that systemd will be replacing init in future releases (RHEL7/CentOS7 and Debian 8). The screenshot below shows systemd running as pid 1 on RHEL7. Debian 8 (not yet released in September 2014) uses parts of systemd, but still has init as pid 1. The first command to learn is systemctl list-units --type=target (or the shorter version systemctl -t target). It will show you the different targets on the system. 16 loaded units listed. Pass --all to see loaded but inactive units, too. Targets are the replacement of runlevels and define specific points to reach when booting the system. For example the graphical.target is reached when you get a graphical interface, and the nfs.target requires a running nfs server. To switch to a target (for example multi-user.target), we now use systemctl isolate (instead of the equivalent init 3 to change the runlevel). To change the default target, we again use this systemctl command (instead of editing the /etc/inittab file). This command removed the file /etc/systemd/system/default.target and replaced it with a symbolic link to the multi-user-.target target. Dependencies are no longer defined by alfabetical order of running scripts, but by configuration in /etc/systemd/system/. For example here are the required services for the multi-user.target on Red Hat Enterprise 7. Debian8 is not fully migrated yet. Typical rc scripts are replaced with services. Issue the systemctl list-units -t service --all (or systemctl -at service) to get a list of all services on your system. And here an example on how to see the status of the sshd service. Sep 10 13:42:21 rhel7 systemd: Started OpenSSH server daemon. Sep 10 13:42:21 rhel7 sshd: Server listening on 0.0.0.0 port 22. Sep 10 13:42:21 rhel7 sshd: Server listening on :: port 22. The chkconfig and service commands are considered 'legacy'. They are replaced with systemctl. This screenshot shows the new way to start and stop a service. And here is the new way to stop and disable a service. This screenshot shows how to enable and start the service again. You can also use systemd to kill problematic services. The poweroff, halt and reboot commands are considered legacy now and are handeld by systemctl. The table below shows the legacy commands on the left and their new systemd equivalent on the right. The systemctl utility has a buil-in remote control providing there is an ssh daemon running on the remote system. This screenshot shows how to use systemctl to verify a service on an other RHEL server. For example systemd-analyze blame will give you an overview of the time it took for each service to boot. 1. Change /etc/inittab so that only two mingetty's are respawned. Kill the other mingetty's and verify that they don't come back. 2. Use the Red Hat Enterprise Linux virtual machine. Go to runlevel 5, display the current and previous runlevel, then go back to runlevel 3. 3. Is the sysinit script on your computers setting or changing the PATH environment variable ? 4. List all init.d scripts that are started in runlevel 2. 5. Write a script that acts like a daemon script in /etc/init.d/. It should have a case statement to act on start/stop/restart and status. Test the script! 6. Use chkconfig to setup your script to start in runlevels 3,4 and 5, and to stop in any other runlevel. Killing the mingetty's will result in init respawning them. You can edit /etc/inittab so it looks like the screenshot below. Don't forget to also run kill -1 1. On Red Hat, grep for PATH in /etc/rc.sysinit, on Debian/Ubuntu check /etc/rc.local and /etc/ini.t/rc.local. The answer is probably no, but on RHEL5 the rc.sysinit script does set the HOSTNAME variable. The script could look something like this. The touch /var/lock/subsys/pold is mandatory and must be the same filename as the script name, if you want the stop sequence (the K01pold link) to be run. The command above will only work when the # chkconfig: and # description: lines in the pold script are there.